Witch! Witch! Burn her! Burn her! Not the typical theme for a boardgame, is it? But not unheard of, either: in Pandemic, we’re fighting against just this kind of disease. But back in the 1300s, there was no real way to fight the plague, the only thing to do was to protect as many of your people as you could. And even that is still the more heroic part of what you will do in Rattus, because you also want everyone else to die. On a map of medieval Europe, all players spread their population cubes and hope that theirs are the only ones left. Each turn in Rattus is pleasantly quick: you may pick a new role card, then you put new population cubes in any region of the map that has rats in it (that is about the only thing that doesn’t make thematic sense: why can I only have people where there’s rats?). Finally, you move the Grim Reeple – that’s a reaper meople, the pinacle of meeple badassness – to a new region, spread the plague to neighbouring regions by putting new rat chips there and then kill a few million people by turning the rat chips in the current region over. Simple, isn’t it? At some point in between you may use the abilities from all your role cards. 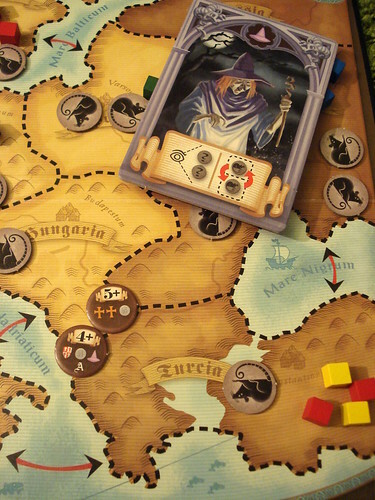 Rattus is a new twist on the popular role-picking mechanic. The usual in role-picking games is to pick a role, use its ability and then put it back and pick another role on your next turn. Not so in Rattus when you pick one of the six roles here, you keep a role you picked until another player takes it from you. Until then, you can use the special ability on every turn and you can still get other roles – including the downside every role in Rattus has. the Witch may look under two rat chips anywhere on the board and exchange them if she wishes. the peasantry has a higher population grow than the other estates, so the Peasant may put one more population cube on the board. 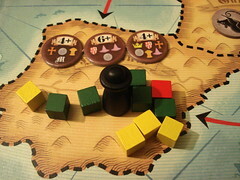 the Merchant can move up to three of his population cubes to an adjacent region. the Knight can move the Grim Reeple by two regions instead of one and may decide to count him as two additional population cubes in a plague outbreak – more on that in a moment. 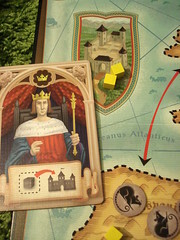 the King, finally, is protected from the plague in his castle and may extends the same protect to one population cube each turn. That cube is safe until the end of the game. I was talking about the role cards having downsides before – but so far, they all sound pretty good, right? The downsides happen when the rat chips in the region with the Grim Reeple are turned over. On the backside, each chip shows some information who will die. First of all, there is the number of population cubes needed to trigger the effect: if there is less cubes in the affected region, the chip has no effect. Then there is the downside of the role cards: the chip can have any number of symbols representing the roles. For each role depicted, the player holding that role card loses a population cube, so logically the more roles you hold the higher your chance to be affected. Finally, there can be an “A” or an “M” on the chip which remove one cube from all players or the player(s) with the most cubes in that region, respectively. After the region is thus ravaged, the next player takes his turn. The game ends when you run out of rat chips or when one player is out of population cubes, which even the manual admits is a rare event. Rattus is a game of tactical decisions and schadenfreude. Long term-strategy is only really possible in two players when you have enough influence on the situation.With four players, the situation changes dramatically between two of your turns: the Grim Reeple can move all across Europe in that time, the plague breaks out three times (plus the one outbreak that you cause) and six more rat chips are added to the board. You’re more restricted to making the best from the current situation with the very limited actions you have. In return, the schadenfreude aspect goes way up with more players. The potential for other players to be hit by disaster is obviously higher and more population cubes are generally on the board, so more chips are actually triggered. Both two player duelsand four player carnage are very fun to play, just the flavour changes between them. A big part of Rattus‘ attraction is its simplicity. It’s easy to explain, easy to play, not so easy to play well. That’s why I’m in two minds about the upcoming expansion Rattus Africanus and the already published Pied Piper as expansions have a tendency to add complexity – but I’ll wait until I’ve actually played the expansion before I pass judgement. For now, I’ll happily take Rattus along when going places because it’s not only fun, it’s also a conveniently small box, good to set up on pub tables and looks good on the table to make others curious about boardgames – which is the whole point of playing in a pub in the first place. And remember: burning scented oils is a good way to make your apartment more homely, but it does not protect you from the plague.